This is a list of ways in which very productive people work differently than the rest of us. In general, I follow most of this list but one of my biggest faults is procrastination. It’s difficult for me to get down to really unpleasant tasks and yet, I continually load my to-do list with more things than a person might easily manage. The author of the article, Travis Bradberry, explains that a frog is the “most dreaded item” that one has to complete. This is especially true on weekends. It seems that there are always more things to sew, more projects to knit, more festivals to attend than I can comfortably cram into one weekend. On top of that, like everyone, I always have a list of things I really have to get done. For example, there are always a few work-related chores to complete and, of course, since it’s the weekend, part of me does not feel as though I should be working. These are the biggest frogs, the least appealing tasks to complete on weekends. This is especially true on a day like today when I am also on call at both the Children’s Hospital of Eastern Ontario and The Royal. I always start these days with rounds with the house staff and prepare myself the day before in case it is busy. This also means that, on these days, I feel I deserve to give myself a break from other work-related tasks since, after all, I am already working on call. Everyone reading this who has been on call knows that there are opportunities during these periods to do other things and I am confident that the most productive physicians actually do use their spare time on call days to complete work-related tasks. These would leave much more of the weekend free and I know this, but can never get past that wish to have just a few relaxing hours on a day on call. However, yesterday, that metaphor that completing difficult tasks was like eating frogs inspired me to work on what was most necessary to complete, and, for some reason, this helped me for today with my tendency to procrastinate. In my own research on procrastination, I did learn that Carleton University, right here in Ottawa, has a Procrastination Research Group: http://http-server.carleton.ca/~tpychyl/index.html You can learn everything you wanted to know about the research that is happening on the website, but if you are reading this to avoid some task, you can quickly learn all the basic up-to-date science on procrastination in this rap video prepared by students learning about the subject: https://www.youtube.com/watch?v=aW1oVRQN3h8 Six minutes and then you can get back to what you should really be doing. 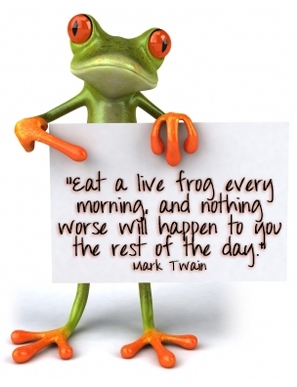 So the suggestion that I should eat frogs and an amazing video have helped me with my procrastination habit, at least for today. Let me know what works for you.